In this comedy series, a group of young friends tries to navigate the complicated maze of life for privileged Millennials in New York City. Lena Dunham stars as the central character, Hannah, who finds herself adrift after being let go from her low-level job and being financially cut off by her parents. In the series finale, Marnie reveals she'd like to help Hannah raise the baby. Hannah begins a new chapter in her life. Following an important meeting, Hannah looks to friends for advice, but has difficulty reaching Marnie. Episode 8 - What Will We Do This Time About Adam? Adam approaches to Hannah with unexpected news. Jessa occupies a day off on her own. Shoshanna assists Ray with his oral-history project, until a fortuitous face-to-face with Abigail, her old boss. Elijah gets ready for an open-call try out for a new Broadway musical, but is thrown off his game by a surprise visitor. Adam and Jessa start shooting scenes for their movie, but she wonders about his creative direction. Hannah interviews prominent writer Ode Montgomery, who gives eye-opening tips on being a woman and a writer. Hannah has a supercharged exchange with Chuck Palmer. Hannah offers cover for Marnie's secret weekender to Poughkeepsie, which she wishes will help clear up an old chapter in her life. Riding a wave of newfound career success, Hannah gets a task to write a story about an all girls surf camp in the Hamptons, where she meets Paul-Louis, an uncomplicated waterski teacher. Hannah gives Principal Toby some unexpected news; Marnie has an unsettling dream; Shoshanna offers to help Ray with marketing his business; Elijah wants an exclusive relationship with Dill. Hannah gets in trouble by the school principal, and her response angers Fran. At Adam's play, an anxious Jessa is concerned about seeing Hannah after their scuffle, and Marnie shares information with Ray. Elijah goes to a cool party at Dill's apartment, where he thinks that he may be one of many. Hannah and her mom, Loreen, embark on a female-empowerment retreat, where Loreen hopes for clarity in her situation with Tad, and Hannah relishes time away from Fran. In Tokyo, Shoshanna enjoys her budding romance with Yoshi, and gets a surprise visitor from the U.S. Jessa meets up with her sister Minerva and asks for a favor. Hannah and Fran disagree about their teaching methods. Marnie fumes over Desi’s decision to launch a major construction project in their studio apartment. Jessa pushes Hannah away over an awkward rice-pudding meetup. Elijah gets closer to Dill Harcourt. Thriving at her new job in Japan, Shoshanna flirts with the boss, but reminds her work friends that she has someone back in America. Hannah makes a shocking discovery on Fran's phone and struggles to contain her emotions. After viewing Adam's performance on a TV police procedural, Jessa shares her insights into his character. An unusual roommate prompts Fran to move in with Hannah in New York. Also, Hannah receives an important call from her father, who is trying to figure out a new kind of dating. Adam and Jessa occupy the day together after they run into each other at an AA meeting. Ray is scared that the new cafe across the road is harming his business. Elijah has a come on from a famous news anchor. Marnie tries to act calm while micromanaging her upstate nuptials to Desi. She requests for Shoshanna to dismiss Fran, Hannah's date, so the girls can prep themselves. Fran has an unusual moment with Adam as she is banned to the boys' area. A gloomy Ray assists Desi with his wedding-day worries. Dunham had accused the accuser of lying about the incident. The internet is emphatic about how much it doesn't care about the 'Girls' creator. The 'Girls' creator also stirred controversy by defending a friend who's been accused of sexual assault. Lenny Dykstra turned up the creep-o-meter on Dunham in a tense Twitter spat Thursday night. The 'Girls' creator cleaned out her closet to benefit Planned Parenthood. Was she less than honest about her dog's history of abuse? Did Lena Dunham Lie About Her Dog's Past? She made an issue of the dog's abused past on social media, but the shelter where she got the dog isn't buying it. The actress bared them on social media this week. The 'Girls' creator debuted a drastic new 'do on Instagram. The actress shares her "pear-shaped pot of honey" with her followers. The actress made a stop at the emergency room after the Met Gala on Monday. Where Will 'Girls' Characters Go from Here? The series is over, but fans will have a hard time forgetting Hannah and her friends. The HBO series is almost over, and its characters are preparing for life beyond the screen. 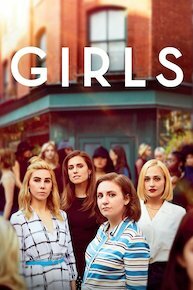 Girls is currently available to watch and stream on HBO. You can also buy, rent Girls on demand at Amazon Prime, Amazon, Hulu, HBO GO, HBO NOW, Vudu, FandangoNow, Google Play, iTunes online.